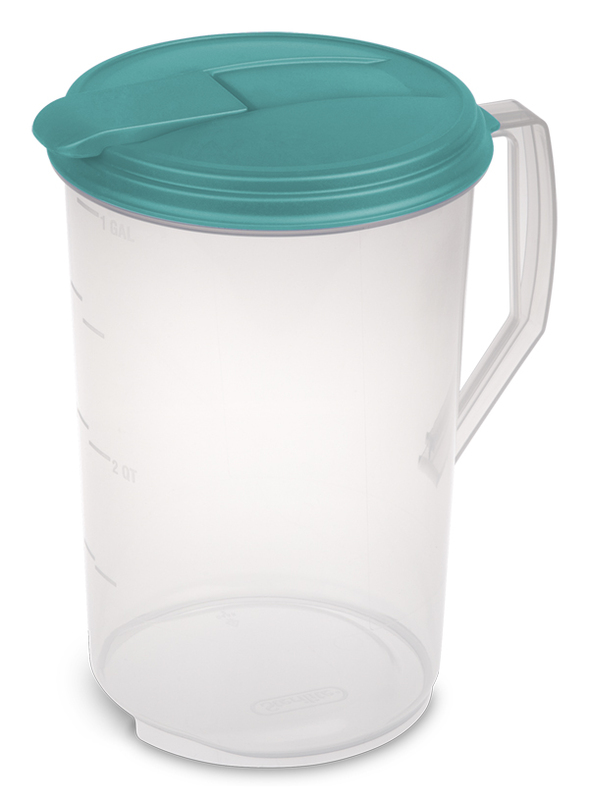 Keep your beverages fresh with the 1 Gallon Round Pitcher. It features a hinged flip-top tab that lifts easily and stays open and out of the way when pouring. The clear base allows you to see when it’s time to refill and a comfort-grip handle aids in controlled and natural pouring. The graduated measure marks make it easy to mix family sized servings. 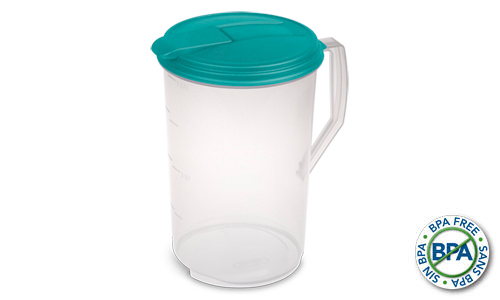 This pitcher is ideal for drinks like, lemonade or iced tea, and allows you to mix your favorite drinks right in the pitcher. 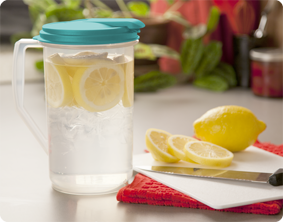 As with all Sterilite drinkware products, the pitchers are easy to clean and are freezer and dishwasher safe as well as BPA-free and phthalate-free. The overall dimensions of this product are 8 5/8" L x 6 7/8" W x 10 3/8" H.
Overall Assembled Size: 8 5/8" x 6 7/8" x 10 3/8"
1 Gallon Round Pitcher is rated 5.0 out of 5 by 3. Rated 5 out of 5 by JaxB from Great Product with quality Design I have purchased multiples of this product. The handle is very comfortable and it has an easy pour. It also has a great look to it and is super durable. It's great for lemonade or Sangria on a hot summer night! Rated 5 out of 5 by llhbq from This product is durable and easy on the wallet! For a few years now we have been using the Sterilite pitchers for water that we distill. We like the change in the pour system. It is much stronger and easy to use. Not only are they great to use, but the price beats any other products that aren't the quality of Sterilite! Rated 5 out of 5 by buckeroo from round drink pitcher it is very durable and great for iced tea !! we love it and use it daily...WHAT A GREAT BARGAIN AND WELL WORTH IT.....STERILITE BEATS OUT EVERY OTHER BRAND WITH ITS QUALITY !!! AND PRICE !! !